From the Hancock County Courthouse, take Hwy 22 southwest for 7.2 miles to Devereux. Turn right (at the backward fork) onto Main Street. Go 0.2 mile to the dead end and turn left onto Jones Chapel Rd. Go west on Jones Chapel Rd for 4.9 miles to Carr Station Road. Turn right onto Carr Station Rd and go 8.6 miles to Lake Sinclair Drive. Turn right onto Lake Sinclair Drive and go for about 5.3 miles to Oconee Drive. Turn left on Oconee Drive and go for about 1.8 miles. Turn left on Sheffield Drive and go for approximately 0.7 mile. Go to a stop sign and turn right onto Barbara Point Road. Go for 0.2 mile to David Williams Rd. The cemetery is on the right side at the intersection of the two roads. 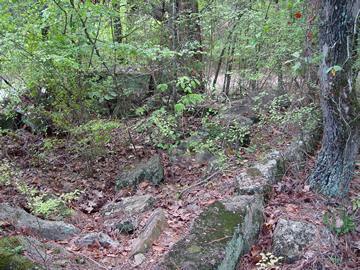 No apparent graves but blocks may indicate a coping or a vault.